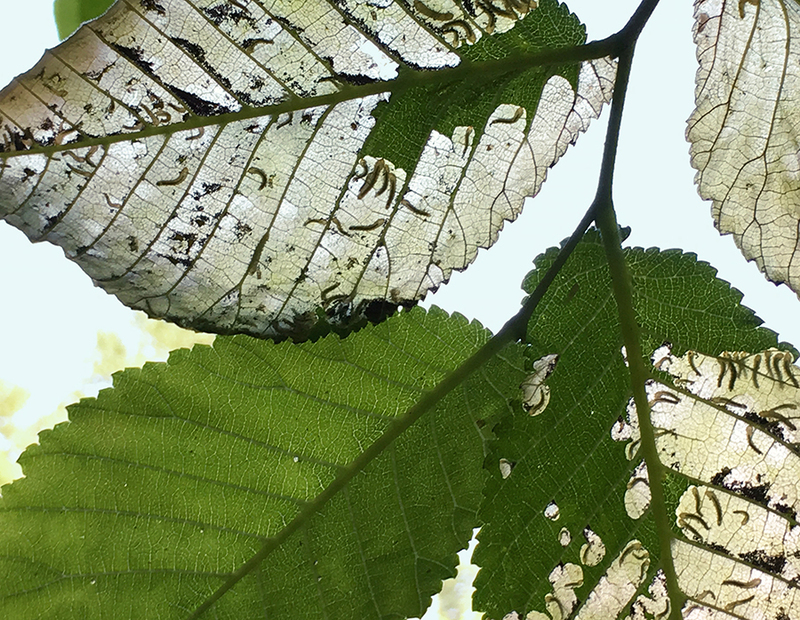 Elm leafminer, Fenusa ulmi, larvae. This sawfly (Hymenoptera: Tenthredinidae) attacks Scotch and Camperdown elms, Engish elm, and American elm. Photo by Robin Rosetta, © Oregon State University. This handbook is intended as a tool for making decisions regarding the control and management of important insect pests in the Pacific Northwest. Originally, it was written for commercial growers, county extension agents, consultants, field and nursery staff, and chemical industry representatives. In recent years we have added sections that are useful to Master Gardeners and homeowners. Most of the pest biology and biological control and cultural control recommendations are identical in COMMERCIAL and HOME settings, but we must emphasize that COMMERCIAL chemical control recommendations are to be used only by licensed pesticide applicators. This handbook is revised and reissued annually. Information in this publication is in a constant state of change. Legal uses of many pesticides change frequently. These changes include de-listing of crops or sites from the label; new formulations requiring different application rates; and restrictions on pre-harvest applications, reapplication intervals, reentry periods or other circumstances. The information included in the handbook is presented with the understanding that no discrimination is intended nor is endorsement by the Cooperative Extension Service implied. Trade names (brand names) of commercial pesticides are listed in this handbook to help identify pesticide common names. Authors have assembled the most reliable information available to them at the time of publication. Criticism of products or equipment not listed is not implied nor intended. Due to constantly changing laws and regulations, neither the authors, nor the Extension Services of Idaho, Oregon and Washington, assume any liability for these recommendations. Any use of a pesticide contrary to instructions on the printed label is neither legal nor recommended. ALWAYS read and follow the instructions printed on the pesticide label. The pesticide recommendations in the PNW Insect Management Handbook do not substitute for instructions on the label. Pesticide laws and labels change frequently and may have changed since this publication was written. Some pesticides may have been withdrawn or had certain uses prohibited. Use pesticides with care. Do not use a pesticide unless the specific plant, animal or other application site is specifically listed on the label. Store pesticides in their original containers and keep them out of the reach of children, pets, and livestock. By law, applicators of pesticides must have in their possession current product labels and must use pesticides in a manner consistent with label directions. If, for any reason, directions given in this publication are not consistent with the label, the pesticide labels always take precedence over entries contained in this handbook. Pesticide Registration—Pesticides are registered federally under Section 3 of the Federal Insecticide, Fungicide, and Rodenticide Act (FIFRA) as amended in 1972, 1975, 1978, and 1988. This law also permits registration (Section 24c) within states under certain conditions to satisfy special local needs. Because 24c uses are state-initiated, they usually are not provided on container labels but are listed on supplemental labels, provided by the dealer or manufacturer (through their website). If a 24c application is made, the pesticide applicator possesses the appropriate 24c label. These uses are identified in the handbook as 24c with the state or states holding the registration identified. Trade Names—To simplify information, trade names are frequently used. No endorsement of named products is intended nor is criticism implied of similar products not mentioned. While pesticide products listed in this handbook are legally registered pesticides, this in no way guarantees efficacy in all circumstances and in every geographical area covered. Pesticide resistance in local areas may render some products ineffective. There may be insecticide names, formulations, and rates labeled for pests or sites that are not included in the handbook. Conversely, not all labels for a given product may include every pest mentioned. It is the responsibility of the user to comply with label directions on the product applied. Developing a format for the use of trade and/or common names in the handbook that would be most useful to the reader has resulted in compromise. The common name is used alone when it is well known. Otherwise, trade names and common names occur together for clarity. The Acute Toxicity Data section of the handbook lists common names, sample trade names, and chemical definitions of insecticides. Due to the rapidly changing nature of labels and trade names, omissions may occur. The information herein is supplied with the understanding that no discrimination is intended and that listing of commercial products, necessary to this handbook, implies no endorsement by the authors or the Extension Services of Oregon, Washington, or Idaho. Criticism of products or equipment not listed is neither implied nor intended. Due to constantly changing labels, laws, and regulations, the Extension Services can assume no liability for the suggested use of chemicals contained herein. Pesticides must be applied according to the label directions on the pesticide container. Groundwater—To protect groundwater, when there is a choice of pesticides, the applicator should use the product least likely to leach. The editors of this handbook are very interested to know how well it meets your needs, as well as how it might be improved. While we take pains to deliver the most accurate information available and we proofread the text extensively, errors do occur. We welcome all relevant comments and suggestions. Please send these to chollingsworth@umass.edu. It would be helpful if you include “PNW Insect Handbook” in the first part of the subject line.